The goal is to balance the energy — get the blood and qi moving. My treatments are patient-centric, determined by patient needs. I use a variety of modalities during the treatment where you lie comfortably on a massage table with a biomat, heated with far-infared light that increases the beneficial alkaline condition of your body, and with use of a magnetic resonance device, the movement of blood and qi increase. Energy pathways or meridians run up & down the body - this energy is measured excessive or deficient on both wrist (sunko) pulses & compared to the throat (jingei) pulse. A good acupuncture treatment will balance the pulses, allowing the body to heal itself. In 30 years of experience, my patients always leave feeling better than when they arrived! Acupuncture - use of needles to access and adjust the energy. I use a gentle Japanese style of acupuncture. GuaSha - a form of scraping the skin to cause friction, releasing the exterior and thus creating new blood. Auricular Therapy - the points of the ear are powerful because the ear is close to the brain. A microsystem of the entire body is represented on the ear as an upside-down embryo — the lobe is the head, etc. Moxibustion - application of heat resulting from the burning of a small bundle of tightly bound herb (Mugwort), called moxa, to targeted acupoints. Used as early as the Ming Dynasty in China. Cupping - a local suction created on the skin that mobilizes blood flow to promote healing. Suction is created using heat, mechanical hand pump, or by negative pressure on Silicon Cups. Moving cups helps release fascia, similar to a deep massage. Reflexology - applying pressure to the feet, hands, or ears with specific thumb, finger, and hand techniques without the use of oil or lotion - based on a system of zones and reflex areas that reflect an image of the body on the feet and hands. Scalp Acupuncture - accessing areas of the brain that control body areas and functions - a specialized study not everyone does, focusing on neurological problems; stroke, traumatic brain injury, and MS.
Massage & Shiatsu - manipulation of superficial and deep layers of muscle and connective tissue with various techniques; also in Shiatsu with finger and palm pressure, and stretches. Pulse Taking is the most powerful diagnostic tool I use. I studied pulse taking with Dr. Tom Duckworth who studied with Sensei Nakazomo ... the man who brought acupuncture to Santa Fe from Japan. The goal of an acupuncture treatment is to balance the energy as measured by the Pulses. I have been seeing Kathleen for acupuncture treatments for over 10 years and would recommend her with full enthusiasm to anyone. She has helped me through a wide range of healing, from the subtlest of irritations to the largest of pains, across both the physical and the emotional spectrum. Kathleen's generous spirit and deep knowledge of the body put me immediately at ease each time I am on the table. As long as I have been a client of hers, she continues to expand her skill set, incorporating new techniques and implements into her practice. I leave each session feeling centered, rejuvenated, and open. Your body, and your mind, will thank you for the time you spend with her. 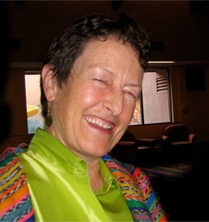 — Cecily C.
I studied and practiced Oriental Medicine in Chicago for nearly 20 years. I am very impressed with the results, thoroughness, and the comfort of Kathleen's treatments. She is one of the FEW American acupuncturists that is excellent with reading the pulses. Can't say enough good about her. Kathleen is awesome! I have been going to her for monthly acupuncture treatments for 2 years and she helped me tremendously. I started treatments for wrist pain related to carpal tunnel syndrome and now the pain is gone with only occasional flare ups. Prior to Kathleen, I tried pain medications, iontophoresis, massage, chiropractic adjustments, physical therapy and nothing worked. I think the world of Kathleen and highly recommend her. She is professional and knows her business, I trust her completely. I learn something new every time I see her. I've been seeing Dr Campbell now for over a year with the onset of Parkinson's disease which has no cure. I've found Kathleen's personalized service dedicated and customized to an individual's needs. Kathleen goes above and beyond with care. I recommend her talents and spirit to everyone. I am 84 yrs old and I had a massive heart attack on New Year's Eve 2006, which required an arterial breathing pump placed on my left groin leading to my heart. In placing it, they damaged nerves and muscle leaving me unable to use my left leg. I was using a walker when I first started started acupuncture with Kathleen, twice a week for 3 yrs. I now get treatments twice a month and I can testify that acupuncture helped me not only to walk, but more importantly, to dance!. Private Practice for nearly 25 years.